Today, it is more popular than ever for women to wear a wedding ring that has a little more personality than a plain band. Eternity bands with gemstones are the perfect way to express your individuality. Many women are choosing eternity bands that feature their favorite gemstone, or one that is significant to her or the couple as a whole. What do you think about this bold, new look? Are there any non-traditional wedding ring trends that you would rather see? Colored gemstones add a hint of flair and color that your bridal set may be craving. It is also a great way to incorporate the month that the two of you were married. For instance, if initially met in September or if you were finally married in September, then a sapphire and diamond eternity band may be the perfect ring for you. 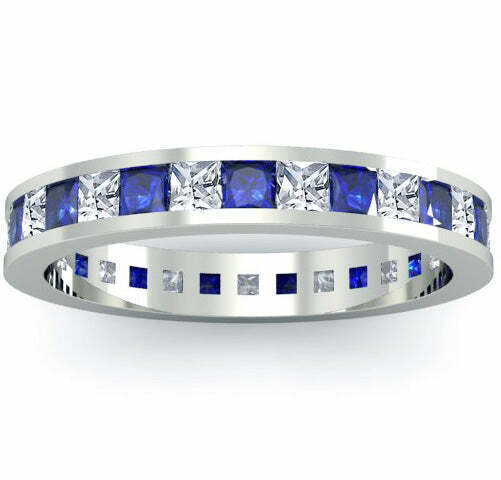 If navy or cobalt blue is one of your wedding colors, it will also be a way to keep part of the day with you always. Many brides-to-be want to express their personality as well as their own sense of style with their wedding jewelry. Would you consider wearing a non-traditional wedding ring?